Researchers and students at Plymouth University will have the chance to use an advanced autonomous wave propelled surface vessel thanks to a new deal signed with a leading UK designer. MOST (Autonomous Vessels) Ltd, based in West Sussex and Devon, are to provide one of their AutoNaut® craft after entering into a licence agreement with the University, through its Marine Institute. 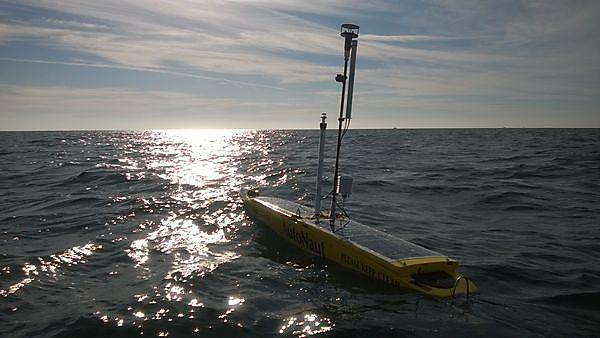 The licence includes access to a 3.5-metre pre-production model, designed to be sent out unmanned into the marine environment and used to conduct research. AutoNaut comprises a single hull with four moving hydrofoils, which harness wave energy as it pitches and rolls in the water. It has photovoltaic panels on the deck to harvest solar energy, and may carry a methanol fuel cell for additional electrical power for sensors and communications. AutoNaut can operate either autonomously or be guided by a pilot using a laptop and internet and satellite communication, and it can stay at sea for multiple months, and can carry sensors mounted on a mast, inside or through-the-hull, and towed behind. Training students in the use of autonomous technology is a fundamental part of the new agreement. AutoNaut has undergone more than 100 sea trials off Plymouth, and survived storm Force 10 winds and seven-metre waves in the Atlantic Ocean while towing a 25-metre acoustic array. In the event that it capsizes, the craft will simply right itself and carry on.